About "The Portable Seminary: A Master's Level Overview in One Volume (Second Edition)"
David Horton is a former businessman, missionary, and mission executive whose publishing experience began nearly twenty years ago. A graduate of Oregon State University, he is currently editorial director at Bethany House Publishers and the author of three previous books, including Boys Life Adventure Bible Storybook. 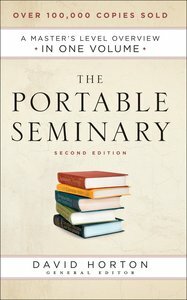 Customer Reviews For "The Portable Seminary: A Master's Level Overview in One Volume (Second Edition)"